Fungi are extremely important microorganisms in relation to human and animal wellbeing, the environment, and in industry. The latest edition of the highly successful Fungi: Biology and Applications teaches the basic information required to understand the place of fungi in the world while adding three new chapters that take the study of fungi to the next level. 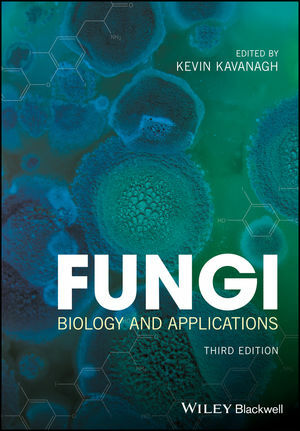 Due to the number of recent developments in fungal biology, expert author Kevin Kavanagh found it necessary to not only update the book as a whole, but to also provide new chapters covering Fungi as Food, Fungi and the Immune Response, and Fungi in the Environment. Proteomics and genomics are revolutionizing our understanding of fungi and their interaction with the environment and/or the host. Antifungal drug resistance is emerging as a major problem in the treatment of fungal infections. New fungal pathogens of plants are emerging as problems in temperate parts of the world due to the effect of climate change. Fungi: Biology and Applications, Third Edition offers in-depth chapter coverage of these new developments and more—ultimately exposing readers to a wider range of topics than any other existing book on the subject. Fungi: Biology and Applications is designed for undergraduate students, researchers, and those working with fungi for the first time (postgraduates, industrial scientists). KEVIN KAVANAGH is Professor of Microbiology in the Department of Biology at Maynooth University, Maynooth, County Kildare, Ireland.